According to geometric optics, an opaque object illuminated by a point source of light casts a sharp shadow whose dimensions can be calculated using geometry. The method of calculation is very straightforward. The source emits light-rays uniformly in all directions. These rays can be represented as straight lines radiating from the source. The light-rays propagate away from the source until they encounter an opaque object, at which point they stop. This is illustrated in Fig. 53. Figure 54: An opaque object illuminated by an extended light source. For an extended light source, each element of the source emits light-rays, just like a point source. Rays emanating from different elements of the source are assumed not to interfere with one another. Figure 54 shows how the shadow cast by an opaque sphere illuminated by a spherical light source is calculated using a small number of critical light-rays. The shadow consists of a perfectly black disk called the umbra, surrounded by a ring of gradually diminishing darkness called the penumbra. 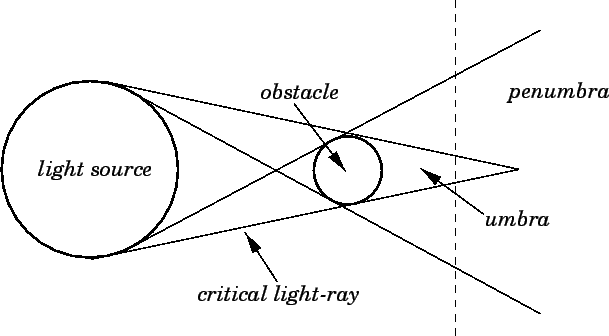 In the umbra, all of the light-rays emitted by the source are blocked by the opaque sphere, whereas in the penumbra only some of the rays emitted by the source are blocked by the sphere. As was well-known to the ancient Greeks, if the light-source represents the Sun, and the opaque sphere the Moon, then at a point on the Earth's surface which is situated inside the umbra the Sun is totally eclipsed, whereas at a point on the Earth's surface which is situated in the penumbra the Sun is only partially eclipsed. Figure 55: Relationship between wave-fronts and light-rays. 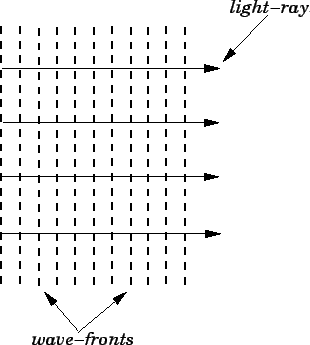 In the wave picture of light, a wave-front is defined as a surface joining all adjacent points on a wave that have the same phase (e.g., all maxima, or minima, of the electric field). A light-ray is simply a line which runs perpendicular to the wave-fronts at all points along the path of the wave. This is illustrated in Fig. 55. Thus, the law of rectilinear propagation of light-rays also specifies how wave-fronts propagate through homogeneous media. Of course, this law is only valid in the limit where the wavelength of the wave is much smaller than the dimensions of any obstacles which it encounters.